Applications are closed. Thank you! 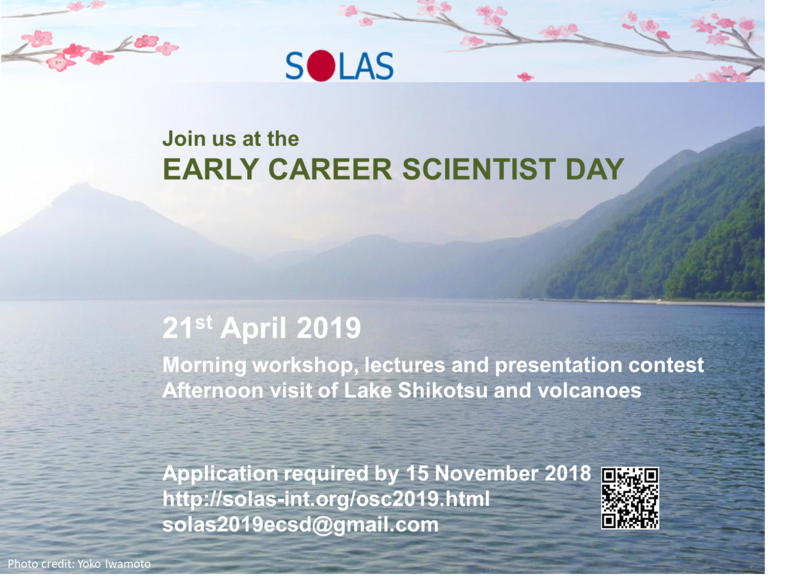 The SOLAS Early Career Scientist Day (ECSD) is an international event that brings together around 30 early career scientists and world-leading international scientists for a day of lectures and practical sessions. In addition, we will do a tour to the beautiful Lake Shikotsu which is surrounded by volcanoes. *Please note that the schedule is tentative and could change. APPLICATION: There are only 30 places to attend the ECSD, so if you are a current student or within three years of completing your PhD, make sure to join us! Please download the document and submit your application by 15 November 2018 to solas2019ecsd@gmail.com. IMPORTANT: No registration fee is required to attend the ECSD. The selected 30 participants will have coffee breaks, lunch, and transportation to and from Lake Shikotsu paid for. Participants are responsible for airfare and registration for the SOLAS conference. Download the flyer as png or pdf.